Back in the Zone | Music | Style Weekly - Richmond, VA local news, arts, and events. 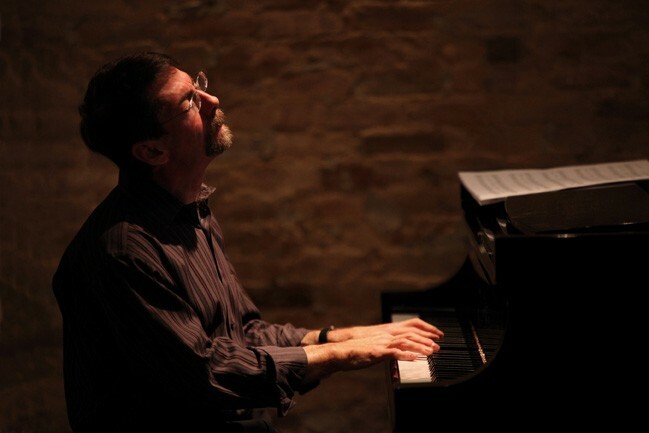 Forward motion: Legendary jazz pianist Fred Hersch will showcase big band arrangements of his songs at the Singleton Center this week. It's possible to be diverted by the surface loveliness of Fred Hersch's playing. But on a deeper level, flowing from the 2011 Virginia Commonwealth University guest jazz artist's singular musical fluency and channeled through his painful personal narrative, the best work reaches toward transcendence. Hersch's former student — and current university jazz-piano adjunct — Wells Hanley calls it "unashamedly going for beauty." Hersch's new recording ("Alone at the Vanguard," on Palmetto Records) showcases his strengths: ravishing melodies improvised with the control of a classical recital. A case in point is his version of Thelonious Monk's "Work," an amazing deconstruction of the angular standard conducted with unfailingly propulsive logic. The complexity and control throughout the recording belies that in 2008 Hersch was incapacitated by AIDS-related dementia, subsequently contracted pneumonia, and spent nearly three months in a coma. Recovery was difficult; at first he couldn't even hold a pencil. Gradually his gifts returned. "People say that they think [my playing] is deeper and freer" Hersch says, calling from his New York City apartment. "It feels that way to me but I am not really an objective judge." He's also expanding his artistic palette. Primarily known for his playing in small group settings, the piano master is putting the finishing touches on "My Coma Dreams," an ambitious theatrical experience incorporating theater, animation and music, based on Hersch's vividly recalled reveries and nightmares while he hovered between life and death. The April 12 concert planned for his residency at VCU reunites Hersch with big-band arrangements of his compositions written for him a decade ago. "I've done a lot of things ... but I have never written a big band chart," Hersch says. The pianist has done some larger-scale work, notably a 2005 recording based on Walt Whitman's "Leaves of Grass," but he's best known for solo or small group work that emphasizes spontaneity and interplay. He's taught for 30 years, notably at the New England Conservatory, Julliard and the Manhattan School of Music. Hersch's view of jazz education is shaped by his experience, tutored through the old-fashioned oral tradition. "I had the benefit of learning from the great masters by just playing with them," says Hersch, who spent years playing with the likes of Joe Henderson, Stan Getz and Art Farmer. "I feel the need to pass that on. Jazz education stresses information, but not what to do with it; like someone who has a very good vocabulary but can't write a story. I try to get students out of the fear of doing something incorrectly, to get them writing stories quickly, even if they don't have the vocabulary yet." Fred Hersch will perform with the VCU Jazz Orchestra I on April 12 at the Singleton Center For the Performing Arts, 922 Park Ave. Show time 8 p.m. For tickets and information, call 828-6776.